Аrticle is devoted to a problem of rise of safety ar maintenance of hoisting-and-transport computers. Dependence of occurrence of vertical oscillations of cargo which can lead to fatigue failures metal constructions of hoisting-and-transport computers, to a rope breakway from weight of cargo and length is installed. In article experimental installation for research of vertical oscillations of cargo on a rope suspension bracket is resulted and the hardware-software complex for processing of results is described. 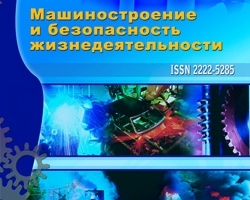 Keywords: reliability and safety at maintenance, vertical oscillations of cargo, the period of oscillations, length of a rope, automatic systems of braking, magnetorheological vibration damper. Kevaev N.M., Kudryakov Y.B., Dubrovin N.A. Magnitozhidkostnoe device for active vibration damping / Patent of USSR № 1433137, cl. A166/00, 1988. Orlov D.V., Mikhalev Y.O., Myshkin N.K. Magnetic fluids in mechanical engineering. Mashinostroenie, 1993. – 268 p.
Kabakov A.M., Pabat A.I., Orlov A.N. Protection of crane vibration // Safety in Industry, 1997, № 5, p. 25-27.